The Travelodge Whitchurch is located to the north of Cardiff city centre, which is a short 10 minute bus or car journey away. 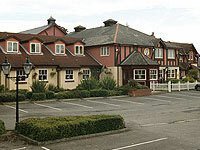 The hotel can be accessed easily from junction 32 of the M4 motorway. It was formerly part of the Innkeeper's Lodge network, but became a Travelodge in October 2010 as part of a planned transfer between the two hotel chains. Visitors to this Travelodge will find a Toby Carvery situated adjacent to it, so they will never go short of food and drink during their stay here! There is free car parking for visitors to this Travelodge, available on a first come first served basis. Toby Carvery situated alongside this hotel.